A training aid and guide for ferro-cement boat building. Covers the two basic construction methods – the upright welded cage and the inverted wood mold techniques. The "Upright Welded Cage Method" is described from lofting through launching in Volume I. The construction of a 65-foot Patrol Boat Hull is demonstrated. 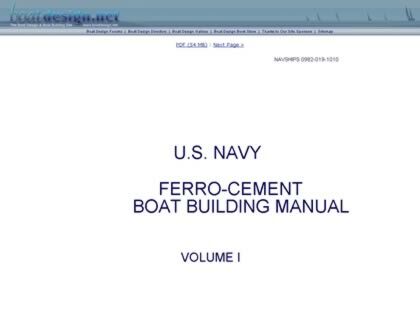 Web Site Snapshot: If available, above is a snapshot of the U.S. Navy Ferro Cement Boat Building Manual - Volume 1 web site at http://www.boatdesign.net/ferro-cement-boat-building-1/001.html as it appeared when this site was added to the directory or last verified. Please Note that Boat Design Net has no involvement with the above web site; all content and images depicted in the above thumbnail are the property and copyright of U.S. Navy Ferro Cement Boat Building Manual - Volume 1 unless otherwise noted on that site. Description: A training aid and guide for ferro-cement boat building. Covers the two basic construction methods – the upright welded cage and the inverted wood mold techniques. The "Upright Welded Cage Method" is described from lofting through launching in Volume I. The construction of a 65-foot Patrol Boat Hull is demonstrated.